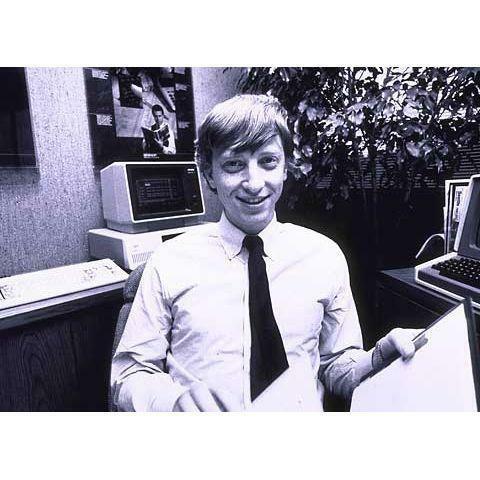 Bill Gates co-founded Microsoft in 1975. And in Albuquerque, N.M., Harvard dropout Bill Gates and his high school friend Paul Allen set up a tiny business to write software for a new microcomputer called the Altair 8800. Their first product is the Altair BASIC language. At some point during that year, the company is called Micro-soft, and then MicroSoft, before it is ultimately named Microsoft. From those modest beginnings, that company went on to help give birth to an entire industry, change the way we live and work, and become one of the largest software companies on the planet, creating countless millionaires -- and several billionaires -- along the way. In July 1987, Microsoft bought Forethought Inc. for $14 million in cash. Forethought had developed a presentation program for the Macintosh, initially called Presenter, which it renamed PowerPoint for trademark reasons. PowerPoint later became one of the core programs of Microsoft Office, which for many years has been the dominant office productivity suite. In August 1985, Microsoft and IBM signed a deal to partner in the development of an advanced operating system called OS/2. The operating system never achieved the widespread popularity of DOS -- or, later on, Windows -- and became a bone of contention between Microsoft and IBM. Although the term open source hadn't been coined at the time, this letter set the stage for Gates' career-long battle with open-source and free software advocates. Two operating systems stand out in Microsoft's long history as having more than their share of fans: MS-DOS 5 and Windows XP. Released in 1991, MS-DOS 5 was stable, fixed the worst problems of its notoriously buggy predecessor, MS-DOS 4, and for the first time broke the 640K memory barrier for DOS, allowing memory beyond that to be used for programs, drivers and so-called Terminate and Stay Resident (TSR) programs. With 2001's Windows XP, Microsoft finally merged its consumer and business lines of Windows, essentially building a consumer-oriented operating system on top of the stable Windows NT kernel. It also finally stopped using DOS as the base operating system, making Windows XP far more stable and reliable than previous versions of Windows. Some people believe XP was too much of a success, because Microsoft has had a hard time getting people to give it up for newer Windows versions. In 2008, more than 200,000 users signed InfoWorld's "Save XP" petition asking Microsoft to continue support for the aging operating system. Which is the most beloved? I'll give the nod to Windows XP. MS-DOS 5, as good as it was, ultimately led to a dead end -- it was the best operating system in a line that eventually died out. Windows XP, in contrast, lives on not only on many people's computers, but in the heart of Windows 7, which still retains its predecessor's merged business and consumer lines. Here you've got to choose among an unholy trifecta of MS-DOS 4, Windows Me and Windows Vista. Released in 1988, MS-DOS 4 was notoriously buggy, and many applications refused to run on it. Users commonly reverted to MS-DOS 3.3 or jumped ship to Digital Research's DR-DOS 3.41 to avoid MS-DOS 4, Microsoft's first serious misstep in operating systems. Windows Me, released in 2000, was buggy as well, and plagued by installation problems and a plethora of hardware and software incompatibilities. But I give the "most reviled" crown to 2006's Windows Vista, which proved to be far more of a fiasco than Windows Me or MS-DOS 4. The five-year gap between the release of XP and Vista was the longest gap between versions of Windows ever, so people had high expectations for Vista. Unfortunately, it was bedeviled by hardware incompatibilities at launch, it wouldn't run on older hardware, and many people disliked its resource-hungry user interface. Making matters worse, many PCs that were tagged as "Vista Capable" couldn't run the full version of the operating system -- a situation that led to a class-action lawsuit against Microsoft.